It’s easy to take charge of your energy bill while helping your community and planet. Most of these tips pay for themselves immediately or in a few years! Check out the Department of Energy’s comprehensive energy savings guide here for more tips, and click the links below to find more detailed help. Set your hot water heater no higher than 120 degrees. You’ll save 15 percent of your water-heating energy. Program your thermostat to 68 degrees F in the winter and 78 degrees F in summer. Install a power strip and use it to easily turn off the TV, VCR, stereo, fan, computer, printer, and other electronics all at once when not in use. Put your computer & monitor on the active power management mode, which can save up to $55 per monitor annually and $45 per computer annually. Avoid using portable or baseboard heaters, because not only are they power hogs, they are also a fire hazard. Check your electricity bill and compare it to your previous usage to get a sense of how you’re improving! Wash clothes in cold water whenever possible, and line dry afterwards. Make sure to not over-dry clothing. 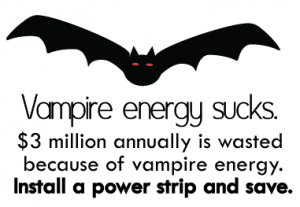 Not only does this save energy, but also your clothes. Dry a few loads in a row to take advantage of the dryer’s reserved heat. Make sure your fridge and oven doors are tightly sealed so no air leaks out. A good trick to figure this out is by closing the door on a dollar bill. If you can easily pull the bill out, your appliance is not tightly sealed. If necessary, adjust or replace the gasket. Keeping refrigerator coils clean with a brush or a vacuum will extend the life of the refrigerator and prevent wasted energy usage. Use the energy saver setting on your dishwasher and clean the filter every so often. Run your dishwasher with a full load. Most of the energy used by a dishwasher goes to heat water. Avoid using the heat-dry, rinse-hold and pre-rinse features on your dishwasher. Instead use the air-dry option. If your dishwasher does not have an air-dry option, prop the door open after the final rinse to dry the dishes. Thaw, or partially thaw, frozen foods in the fridge before cooking. Get a comprehensive Energy Audit to identify the major energy issues in your home. Check your furnace filter every month. If the filter looks dirty, change it. At a minimum, change the filter every 3 months. 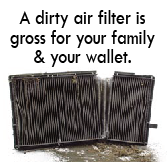 A dirty filter will slow down air flow and make the system work harder to keep you warm or cool — wasting energy! Is your dryer having problems drying large loads of laundry? Hire a professional to clean your dryer vents to prevent dryer fires and save energy. Use energy-efficient lighting and fixtures. Use a light dimmer when using regular bulbs. However, do NOT use dimmers with fluorescent bulbs. Use a fan instead of an air condition when possible. Add window tint to minimize solar heat gain and reduce your air conditioning needs. Plant deciduous trees outside your largest west-facing window for shade in the summer to reduce your air conditioning needs. Block air gaps around plumbing pipes and electrical cables, windows and doors with caulking and weather-stripping. Buy appliances with the ENERGY STAR® label. Buy the smallest model of the appliance that meets your needs; smaller models often use less energy. For example, consider cooking with a slow cooker instead of an oven. Add extra insulation to your attic. **NOTE: Always seal your home before adding insulation. Insulate hot water pipes and put a water-heater blanket on your hot water heater. Insulate walls with cellulose or foam insulation when renovating. Use low-e double pane windows in new construction, additions or renovations. Install awnings or shades over windows on the south or west side of the building.